More than ever before, our programmes are crucial to ensure that young people gain the skills they need to thrive in employment, higher and further education. We need to fundraise £750,000 annually to support access to our courses and work with disadvantaged young people from across Scotland. We deliver our programmes in Scotland from our centre based at Loch Eil, near Fort William. It’s the ideal location for big outdoor adventures that lead to significant learning. We also offer apprentice and graduate development programmes for a number of Scottish businesses. Supporting Scotland’s young people through turbulent economic times has never been so important. By enabling them to take part in an Outward Bound® course, we aim to cultivate a generation with confidence, resilience and ambition. In doing so, we hope that they will go on to become our future business and community leaders, who will pay back the investment made in them and go on to make Scotland a better place. They’re spending three weeks of their summer in the wilderness of the Scottish Highlands, learning about themselves, about others and the world around them. They’ll get the chance to see their true potential and reflect on what they aspire to achieve in life. They’ll have opportunities to build their confidence and resilience, test their sense of independence and push themselves to the limits of their ability. They’re taking part in the Outward Bound Skills for Life Award course because someone just like you, has given them the opportunity. She took part on an Outward Bound course last year, thanks to the support of a Friend of The Outward Bound Trust in Scotland. At 17, Harriet, in her own words, was a typical teen from Glasgow. She had no ambition or drive, and was content to continue her part time job in her local hairdressers when she had finished school. Then the opportunity came along for her to take part. Becoming a Friend of The Outward Bound Trust in Scotland means equipping young people with the skills that will last them far beyond classroom walls. You’ll be supporting them to forge their own long-term successes and achievements in life, at work and in their communities. Ultimately, you’ll be shaping them into people who’ll be able to return the investment made in them, by contributing to building a fairer and stronger society in Scotland. The good news is that making this happen doesn’t demand vast sums of money. 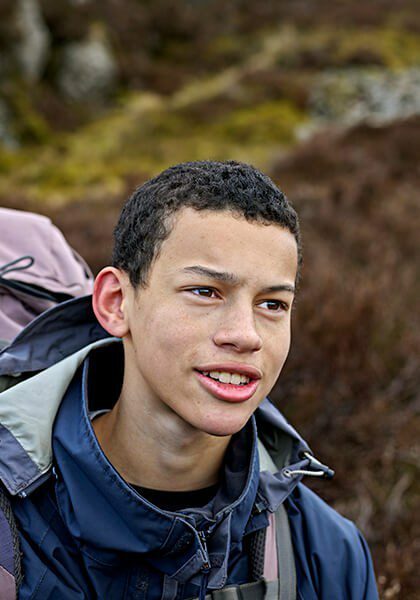 Become a Friend and donate a minimum of £1,500, with your donation going directly to funding a young person to take part in an Outward Bound Skills for Life Award. As a thank you, our Friends enjoy access to exclusive events, to which you will be given priority entry, and an annual reception at St James’s Palace. We’re aiming to enable 100 young people each year to take part in an Outward Bound Skills for Life Award and so we need you on board to make this a reality. WHILE OUT ON THE LAST EXPEDITION I RECEIVED MY 5TH YEAR EXAM RESULTS AND THEY WEREN'T WHAT I HOPED THEY WOULD BE. THANKS TO SOME FANTASTIC PEOPLE I MANAGED TO KEEP MYSELF TOGETHER AND MAKE IMPORTANT DECISIONS ABOUT MY LIFE. If you're a teacher or youth worker, why not nominate a young person to take part? We know from 70 years’ experience combined with lengthy evaluation work that an Outward Bound summer adventure can change a young person’s life. That’s why we’re asking you to nominate a pupil to take part in one of our Outward Bound Skills for Life Award in the Highlands. To nominate a pupil please download and complete our reference form and print out the application form for your pupil to fill in. Pupils need to be aged between 15 - 19 years old.